One journalist's wild summer on the road with the world's most popular cult rock band, Phish. Despite their enormous success and their status as America's biggest cult rock and roll band, Phish remains an enigma. Each of their albums has sold more than 500,000 copies, and their concerts sell out instantly, but the band makes a virtue of ignoring the mainstream, and the fans rather prefer it that way. 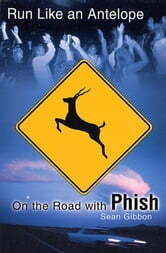 In Run Like an Antelope: On the Road with Phish, Sean Gibbon deftly and hilariously chronicles this unique musical subculture. Inspired by the offbeat road stories of Hunter S. Thompson and Bill Bryson, among others, Gibbon resolved to follow Phish and their kite's tail of hundreds of thousands of followers on their 1999 summer tour. What he discovered is a new kind of American tribe: a mixture of aging, resigned Deadheads, wealthy college kids, and dedicated Phishheads, all bound together by their belief in the band, passion for the music, and energetic spirit, which transform Phish into an experience. His ensuing adventures among the Phish fans constitute a memorable, insightful, uproarious odyssey into this new frontier of American pop tribalism. Whether he's being kidnapped by a group of ebullient Georgia Tech coeds, or being serenaded by devoted fans on the institution of Phish, Gibbon navigates the wild, fascinating Phish experience with verve and a keen eye, brilliantly communicating both the enormous energy of the band's music and the distinct character of their fans. Redwood to Deadwood: Hitchhiking America Today.